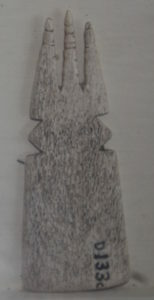 Were the combs only used by people of higher class or commonly used by most of the people in ancient Egypt? In short, we don’t know. 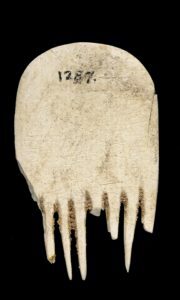 They are only found in elite graves, but people from lower social classes used a wide variety of objects and items during their lifetimes that were not buried with them. 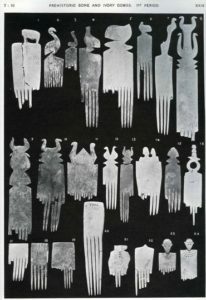 The graves with the combs in the Pre-Dynastic period at cemeteries were found in rich graves, containing a range of higher status objects. Im going to go a step further and say that I dont think the AEs wore head dresses, nemes, crowns or whatever they are called. I believe that they had their hair shaved into those shapes. They all had braided hair. Look up King Tuts mask in 360′ view. Those are braids not a headdress. Thank you for your exhibition and this website. Because of your work and your recent finding, I have another piece linking Kemet (Ancient Egypt) to the rest of Black Africa. Curators are scholars too, and you sir, need to publish these findings so the world can begin to acknowledge you for generations to come! 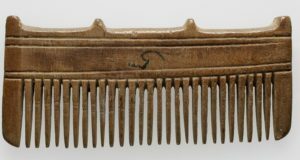 One of the most drastic examples of AE and SSA cultural overlap that doesn’t necessarily translate to genetic closeness are the Afrocombs found in many neolithic Egyptian sites. While Afro textured hair was definitely present, this wasn’t the predominant hair type. Examination of AE hair as early as the predynastic shows a tendency towards cross sections with oval shapes, not flattened, elliptical shapes characteristic of the Afro-textured hair most people associate with afrocombs. There are so few examples of hair from this period that I, personally, wouldn’t generalise across the population. It’s worth noting the variety of hair types amongst African people. True re the variety of African hair. When it comes to the Nile Valley, there seems to be this huge attempt by people who support an African origin of AE, to try to force theyre hair into a range where some of it clearly does not belong. Instead of raising the bar of what African hair is capable of expressing, they rather try to force Egyptian and Nubian hair into the old stereotyped construct, just to be on the safe side. Some people here also seem to drool over Herodotus’ description of AE hair, as whooly, which is only partly supported by examinations of mummy hair. I checked over the comments on this blog to find instances of where people here “drool” over the Herodotus quote on woolly hair. I may have missed them, but I couldn’t find any. There is a multitude of portrayals that supports the Afro hair texture. Africa has the most genetically diverse population on the planet. Of course this genetic diversity is present within the hair styles and textures. Women of East African descent tend to have straighter hair than those from different areas of the continent. The hairstyles that we see present are a representation of the styles wore by the indigenous populations. Braiding, Afros, etc were all present as they are to this day. 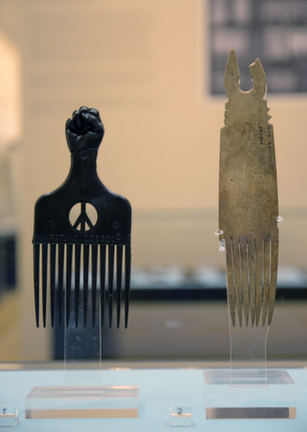 So there should be no surprise as to why we are seeing Afro combs coming out of the Nile Valley. There seems to be a small attempt by those who where educated in eurocentric ideas and beliefs to never realize what they have been taught and hold dear and true, is a lie. However, many people here would drool over my Master’s degree project, ‘The Africanness of Ancient Egypt.’ Of which I successfully defended thereby attaining my first masters in African Studies from Ohio University class of 2015. I still galls me that Eurocentrists, particularly the largest population emanating from United States, still deny the obvious truth with their last breath.